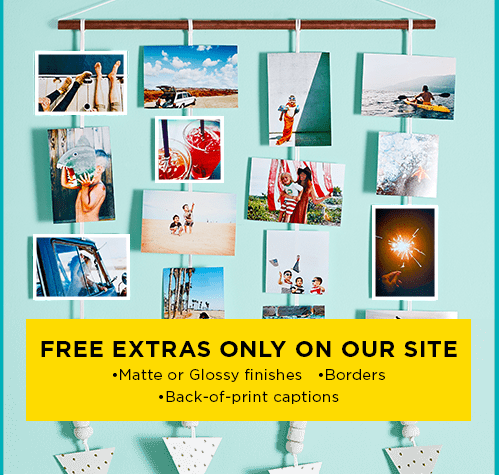 One of the best and most affordable places that I have found to print your pictures is Shutterfly. It has to be during one of their deals when they offer free prints, because you do have to pay for shipping....but if you cash in during this time, you will spend a fraction of the cost. TODAY ONLY they are offering UNLIMITED FREE PRINTS and you can choose your finish, a border and back-of print captions for free as well if you do it online. Shipping starts at a base of $1.87 for any order and then add $.08 per print. This makes each print about $.09 each, which is comparable to Sam's Club or Costco, but I think the quality is much better from Shutterfly and you get all of the extras TODAY ONLY that you can't get from those other stores.